Today is May 18th. It's 43 degrees. It has been so gloomy for weeks and raining non-stop for the past 5 days. What. is. going. on? I'll tell you what's going on. Mother Nature is asking for the worst kind of trouble. From me. Oh yeah, I can be pretty scary if provoked enough. While I could complain all day about the lack of sunshine, I decided to shake off the blues, take the high road, and make chocolate chip cookies. 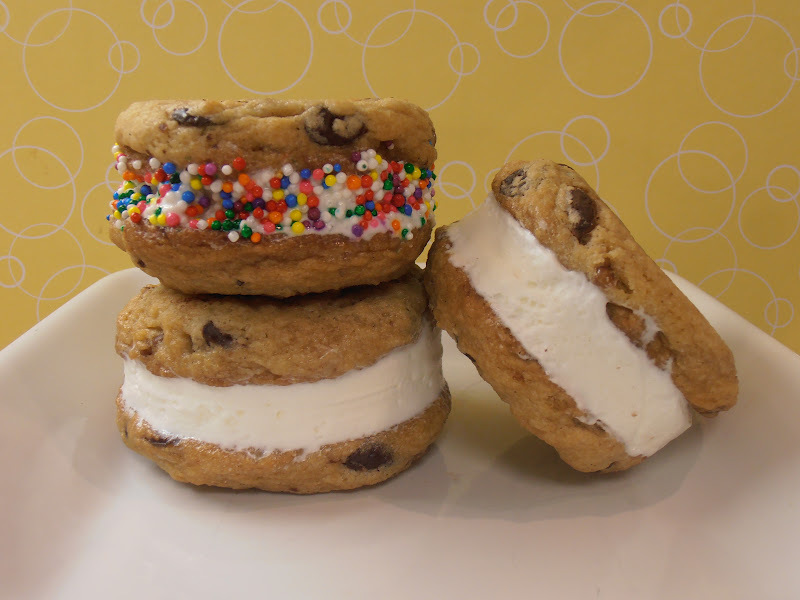 What the heck, let's up the ante and make ice cream sandwiches out of them. I'm very well aware that these treats could be dangerous to a serious cookie addict and ice cream lover like myself, but you know what? I just don't care today. All bets are off. Screw the whole calorie counting. While we're at it, Mother Nature can go jump off a bridge. That is until she produces some rays for this frustrated gal. Then all will be forgiven. Maybe. Heat oven to 325º degrees. Mix flour, salt, and baking soda together in medium bowl; set aside. Either by hand or with electric mixer, mix butter and sugars until thoroughly blended. Mix in egg, yolk, and vanilla. Form scant ¼ cup dough into ball. Holding dough ball using fingertips of both hands, pull into two equal halves. Rotate halves ninety degrees and, with jagged surfaces exposed, join halves together at their base, again forming a single cookie, being careful not to smooth dough uneven surface. Place formed dough onto one of two parchment paper-lined cookie sheets, about nine dough balls per sheet. Smaller cookie sheets can be used, but fewer cookies can be baked at one time and baking time may need to be adjusted. Use an ice cream scoop. Three rows on the LEFT side of the tray: CI's form. Three rows on the RIGHT side of the tray: My form. Bake until cookies are light golden brown and outer edges start to harden yet centers are still soft and puffy, 15 to 18 minutes (start checking at 13 minutes). Cool cookies on cookie sheets. Be sure cookies are completely cool before adding next step. Scoop a generous portion of your favorite ice cream and sandwich between two cookies. Roll in sprinkles, nuts, candy bits, coconut, etc. if desired. Yields: 2½ dozen cookies or about 15 Chipwiches.